These documents can be downloaded, laminated or placed in poly pockets to provide information to the general public on International Woekers Memorial Day, the real cost of work tragedies and the commitment from trade unions and organisations such as Scottish hazards and the wider Hazards movement to continue to remember the dead and fight for the living and to strive for better health and safety legislation, stronger enforcement and safer, healthier and fairer work for everyone. Please join in their 150th year at the International Workers’ Memorial Day Commemoration. It will be held on Saturday 28th April in the Persley Walled Garden, Bridge of Don, Aberdeen. Please gather at 12.30pm for the event at 1pm. 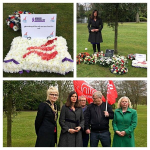 The commemoration in West Lothian organised by West Lothian TUC and West Lothian Council will take place at 12.30pm on Saturday 28th April at the memorial at Bathgate Sports Centre, TorpichenRoad, Bathgate, (EH48 4LA). A light lunch will be served afterwards. 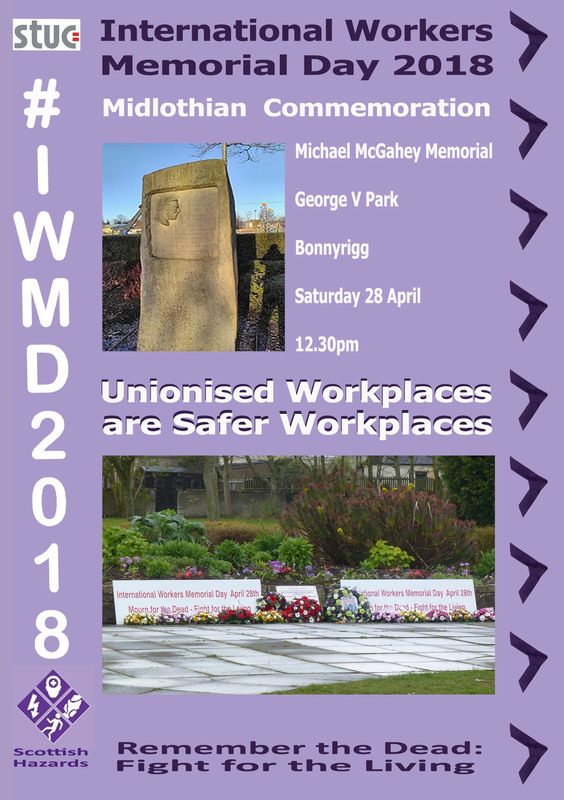 Midlothian TUC, with the support of Midlothian Council, will commemorate International Workers Memorial Day on Saturday 28th April at the Michael McGahey Memorial in Geore V Park, Bonnyrigg (EH19 2AD) starting at 12.30pm. North Lanarkshire TUC’s commemoration will take place at the gates of Summerlee Industrial Museum on Saturday 28 April at 12 noon. 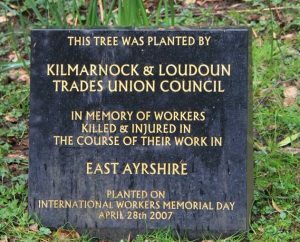 Edinburgh’s commemoration will take place at the workers memorial tree and plaque in West Princes Street Gardens, (EH2 2HG) on Saturday 28th April commencing at 12.30pm. The Municipal Buildings in West Bridge Street (FK1 5RS) is the venue for the commemoration organised by Falkirk TUC, it will take place on Saturday 28th April commencing at 12 noon. 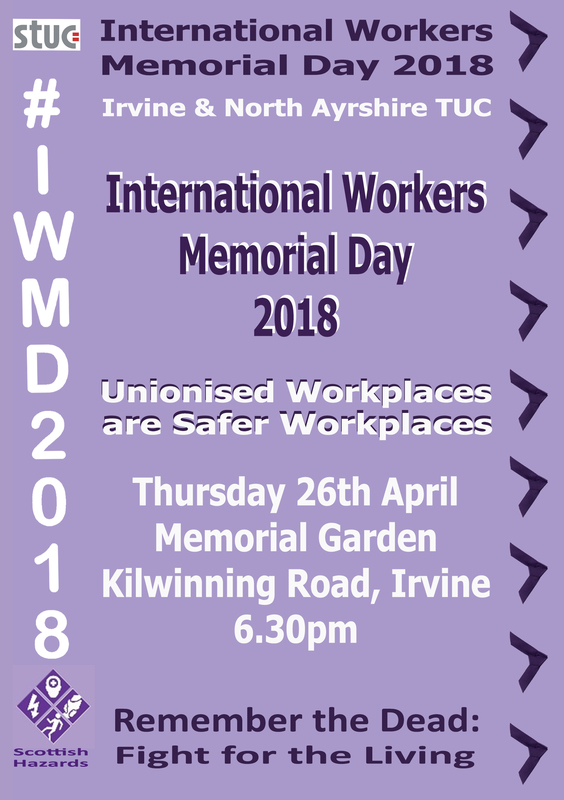 The International Workers Memorial Day event in Fife will take place in Beveridge Park, Kirkcaldy KY2 5PH at 11.00am on Saturday 28th April. 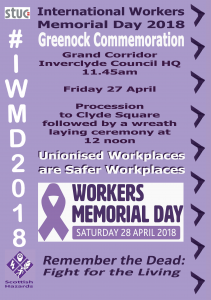 The Glasgow event to mark International Workers Memorial Day 2018 will take place on Saturday 28 April at 12 noon at the memorial adjacent to to the People’s Palace and Winter Gardens. Gathering in North Ayrshire at 6.30pm at the Memorial Garden, Kilwinning Road, Irvine. Meet from 6.15pm at Wee Annie’s Shop in Kilwinning Road Irvine. Event organised by Irvine and North Ayrshire Trades Union Council. International Workers Memorial Day will be commemorated at Dean Castle Country Park, Dean Road, Kilmarnock (KA3 1XB) on Saturday 28th April starting at 11.00am, assembling at the Dowar House from 10.45am. The commemoration of International Workers Memorial Day will take place on Saturday 28th April at the memorial outside Renfrew House, Cotton Street, Paisley starting at 1.00pm. 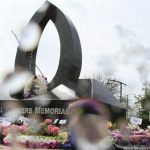 Renfrew’s International Workers Memorial Day event will take place on Saturday 28th April at the memorial cairn in Robertson Park, Paisley Road, Renfrew starting at 11.00am.